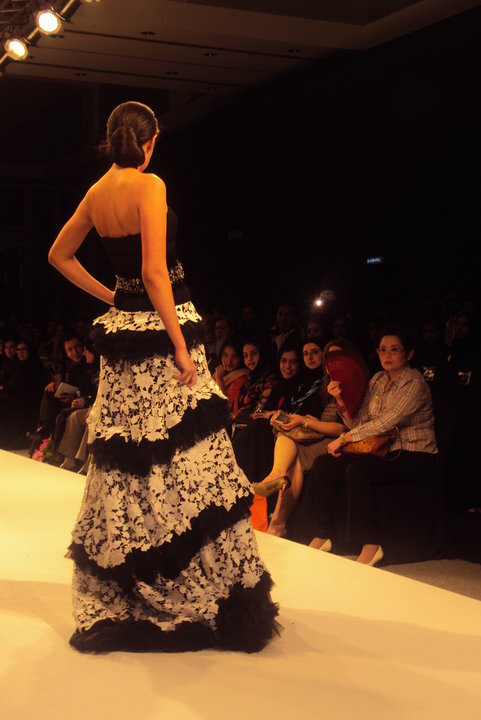 Rahil Rose Hesan presented her first Runway Show @ Dubai Fashion Week 2010. Graduated Fashion Designs in London, her feminine display of elegant gowns were sight to behold. Lines were made to enhance the woman curves and the subtle embellishments of crsytals and brillants assured her total control – feminine, luxe and sophisticated. First time on a couture runway is a daunting task for any designer, but Rahil Rose Hesan carried it off with quiet grace and a point of view that promises to bring a breath of fresh air to Dubai’s fashion scene. Restrained elegance is best to describe her first runway collection this season, rightly choosing a safer side, that of embracing the old-schooled glamour..and the way I look at it..it was the best choice.While excessive embellishment is the mantra in any Middle Eastern kind and definition of couture, Warda undercut traditional extravagant and focused instead to the timeless glorification of femininity. Rahil Hesan oeuvre of pristine white, black and red dresses, manages to express her own flair for making chiffon flow and flutter in an immaculately wispy way..
Red Carpet ensemble paraded the runway with its simple cut black chiffons with minimal embellishments. Whirl of breezy luxe and drop-dead gorgeous silhouettes in soft chiffon, georgette, satin and jersey gave a well meaning of “less is more”. The WARDA TEAM of Rose, Bandoix Flores and Ushi Sato did a fabulous editing of each piece from the color palette of black with black, black with ivory and then fiery red in that order. Draped bodices, with flowing skirts and a masterful insertions of laces, ruched jersey in sculptured curves..exhibits professional know how rather than an amateurish effects of neophyte wannabes on the runway. this is soooo wow…thank you Moma Butz….